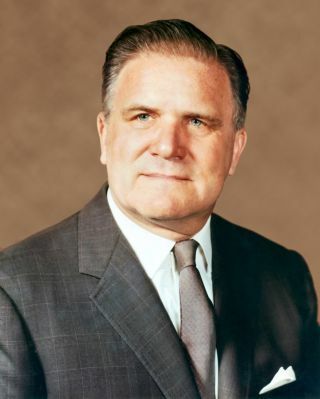 James E. Webb was NASA administrator from 1961 to 1968. He oversaw the Gemini program, the beginning of the Apollo program, and the development of Cape Kennedy and the Johnson Space Center. In 2019, a massive telescope will launch from the Earth, providing an in-depth view of space and bringing into focus objects older and farther away than we have ever seen before. The instrument will bear the name of James Webb, a champion of the early space program, who saw further ahead than many other people at the time. "Many believe that James E. Webb … did more for science than perhaps any other government official, and that it is only fitting that the Next Generation Space Telescope would be named after him," says a NASA biography of Webb, who ran the space agency from 1961 to 1968. James Edwin Webb was born Oct. 7, 1906, in Tally Ho, North Carolina. He was the second of five children born to John and Sarah Webb. In 1938, he married Patsy Aiken Douglas and the couple had two children, Sarah Gorham and James Edwin Jr.
Webb attended the University of North Carolina, receiving a degree in education. He served as a pilot for the Marine Corps from 1930 to 1932. In 1934, he began to study law at George Washington University, and was admitted to the Bar of the District of Columbia in 1936. For the next eight years, he served in various government positions for North Carolina leaders, as well as corporate roles in the Sperry Gyroscope Company of New York. In 1944, he re-entered the Marine Corps for World War II. After the war, Webb returned to Washington and served in several positions. President Harry Truman asked Webb to serve as under secretary of state. At the end of the Truman administration, Webb left Washington to work with the Kerr-McGee Oil Corp. in Oklahoma. Only a few years later, Webb was contacted by the White House to meet with Vice President Lyndon Johnson about leading the newly formed National Aeronautics and Space Administration (NASA). After the Soviet Union put the first human-built satellite, Sputnik, into orbit, the United States entered a space race. However, Webb did not think he was qualified to lead NASA. "It seemed to me that someone who knew more about rocketry, about space, would be a better man for the job," Webb said during an interview as part of an oral history project sponsored by the Lyndon B. Johnson Library. But President John F. Kennedy disagreed, arguing that the position required more policy than science. "President Kennedy said, 'I want you for this reason,'" Webb said. "And I've never said no to any president who has asked me to do things." On Feb. 14, 1961, Webb became the second administrator of NASA. Only three months later, Kennedy announced his desire to put a man on the moon and returning him safely to Earth by the end of the decade. During his first presentation to Kennedy, prior to the president's announcement, Webb requested over $300 million dollars to increase the work done on Saturn booster rockets, with the aim of putting an astronaut into space. "Kennedy approved the booster side; he did not approve the spacecraft side," Webb said. Then, in April 1961, Yuri Gagarin became the first human to orbit Earth. "Gagarin's flight, coming after the interval since Sputnik, and with the image that Russia could in fact produce the first manned flight ... put a strong impulse on building some additional booster power," Webb said. Funding was revisited and increased. "After Gagarin's flight, [Johnson] felt that we just simply couldn't stand still. We had to move," Webb said. Under Webb's tenure, the Gemini program picked up and the Apollo program began. Humans began to spend time in space. "We didn't feel sure that we could win it, but we felt sure we could compete," Webb said. But the new NASA administrator didn't focus solely on the immediate competition with Russia. According to NASA, "Webb believed that the space program was more than a political race. He believed that NASA had to strike a balance between human spaceflight and science because such a combination would serve as a catalyst for strengthening the nation's universities and aerospace industry." Under Webb's leadership, NASA built up Cape Kennedy in Florida, where rockets could safely attempt to launch into space. They acquired a large plant in New Orleans to test some of the larger boosters. They set up Johnson Space Center in Houston, Texas, to build some of the large manned spaceflights. This buildup of the south led some to criticize the new organization for favoring what was, after all, Webb's home region of the United States. But Webb claims that he did not bend to political pressure. "The basic reason was to get the space program done in the most effective way possible, and to build scientific, engineering, and managerial strength for a long time in the future," Webb said. "We were not just constructing the fastest, quickest way to get a few payloads into orbit. We were building permanently." While some senators claimed to have won locations for their state, Webb said he did not factor in political ramifications. "I said, if it had been subject to political influence, it would be in Boston, because that's where the most pressure came from," he said. Webb also focused on building up resources outside the government, strengthening universities and private programs. "The mandate in the law was not to build a strong NASA but to increase the competence of the United States to deal with scientific and technical matters in aeronautics and space," he said. During Webb's tenure, NASA invested in the development of robotic spacecraft and sent scientific probes to Mars and Venus. By the time he retired, NASA had launched more than 75 space science missions to study the stars, the sun, the Milky Way, the moon and the environment around Earth. America's first human flight and first orbital flight came under Webb's tenure, as did the first two-man flight and the first human walk in space. Webb "enhanced the role of scientists in key roles," NASA reports. "He gave them greater control in the selection process of science missions and he created the NASA University Program, which established grants for space research, funded the construction of new laboratories at universities and provided fellowships for graduate students." On Jan. 27, 1967, astronauts Virgil "Gus" Grissom, Edward White, and Roger Chaffee were killed during a test of the Apollo 1 capsule. "We've always known that something like this was going to happen sooner than later," Webb said in an interview. "Who would have thought the first tragedy would be on the ground." Webb asked President Johnson to allow NASA to conduct its own examination, which it did, presenting the results of the investigation to the public. Webb presented the findings to various congressional committees, deflecting much of the blame onto himself. "While he was personally tarred with the disaster, the space agency's image and popular support was largely undamaged," according to a NASA biography. As the Johnson presidency came to a close, Webb made the decision to step down as the administrator of NASA. In his interview with the LBJ oral project, he said he wanted there to be a vacancy to allow the next president to assign an administrator of his own choosing, though he worked to establish continuity in the agency's leadership. Webb stepped down as NASA administrator on Oct. 7, 1968. He remained in Washington to serve on various advisory boards, including as a regent of the Smithsonian Institution. Only a few months later, Apollo 11 landed the first human astronauts on the surface of the moon. John E. Pike, director of the Space Policy Project at the Federation of American Scientists, later said Webb played a key role. "The reason we got to the moon before the Russians was they didn't have anybody to pull it together. The critical difference was we outmanaged them," Pike said. Webb's role was visible in both the 1998 miniseries "From the Earth to the Moon" and the 2016 movie "Hidden Figures." Webb died on March 27, 1992, and was buried at Arlington Cemetery. As early as 1965, Webb wrote that a major space telescope, then known as the Large Space Telescope, should become a major NASA effort. It would be decades before the project began. In 1996, NASA began construction on a large space telescope, which has been named the James Webb Space Telescope (JWST). It is often described as the scientific successor to the Hubble Space Telescope. However, JWST will not replace Hubble, which is still in operation. The two instruments complement one another, but they are not identical. Instead, JWST will be able to see objects older and farther away than previous instruments, looking deeper in the infrared than Hubble is capable. While Hubble has a single 7.9-foot (2.4 meters) mirror, JWST has 18 hexagonal mirror segments with a combined size of 21 feet 4 inches (6.5 meters). Launch for JWST has been recently pushed back to spring of 2019. "It is fitting that Hubble's successor be named in honor of James Webb," NASA Administrator Sean O'Keefe said in a statement. "Thanks to his efforts, we got our first glimpses at the dramatic landscape of outer space. He took our nation on its first voyages of exploration, turning our imagination into reality. Indeed, he laid the foundations at NASA for one of the most successful periods of astronomical discovery. As a result, we're rewriting the textbooks today with the help of the Hubble Space Telescope, the Chandra X-ray Observatory, and the James Webb Telescope."